Bringing home a new furry friend is an exciting milestone for all pet parents. What starts as a nervous introduction to a new environment soon turns into an emotional bond like no other. No matter how your pet joins the family, they’ll bring companionship and a unique personality along with them. Pet owners enjoy many emotional and physical benefits like increased exercise, reduced stress and more social interaction. However, these benefits come with a cost — both in time and finances. First time pet paw-rents should prepare for the financial responsibilities of being a pet owner for upwards of 10-15 years (or more) since pet ownership is a lifetime commitment. Dogs and cats become loved members of our family, bringing many responsibilities along with them. In addition to expected upfront costs, pet ownership also has unforeseen costs like emergency care and boarding that owners don’t always consider when adopting or purchasing their fur baby. Home renters can expect additional costs like pet deposits, fees and rent as well as breed restrictions at certain complexes. It’s important to budget for these extra costs since missing rent payments can have adverse financial effects. 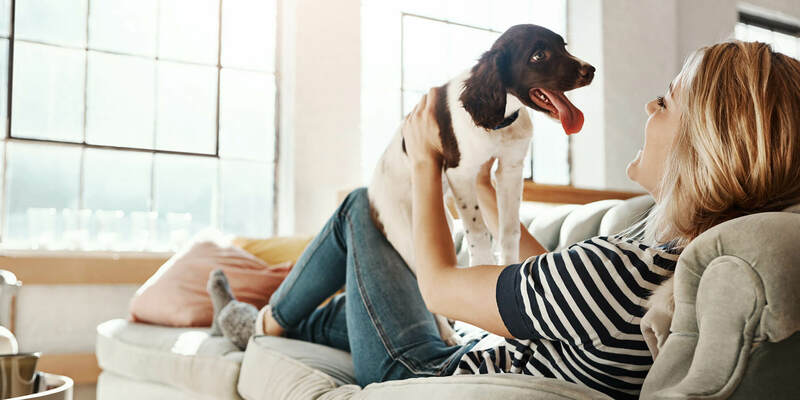 If you’re ready to commit to pet ownership, read on to learn the must-have items for first time paw-rents and the financial costs that accompany your new best friend. If owning a pet isn’t the best decision right now, consider fostering, pet sitting or walking dogs as a side hustle to care for animals without the responsibility of being a full-time pet parent. A pet is quite an investment — financially and emotionally. Adoption fees can be upwards of $400-$600, although shelters rarely ask that much. These higher fees usually come with some medical care such as spay/neuter surgery, current vaccinations and certain medical screenings. Purchasing your pet from a breeder can be even more expensive ($800—$3,000) depending on the breed, and often doesn’t come with a spayed or neutered pet. Along with initial medical costs to make sure your pet is healthy, preventive care and recurring vaccines can rack up large vet bills. After medical care, food is the next largest expense and with average life spans ranging from 10-15 years, these annual costs have a big impact on your pocket. 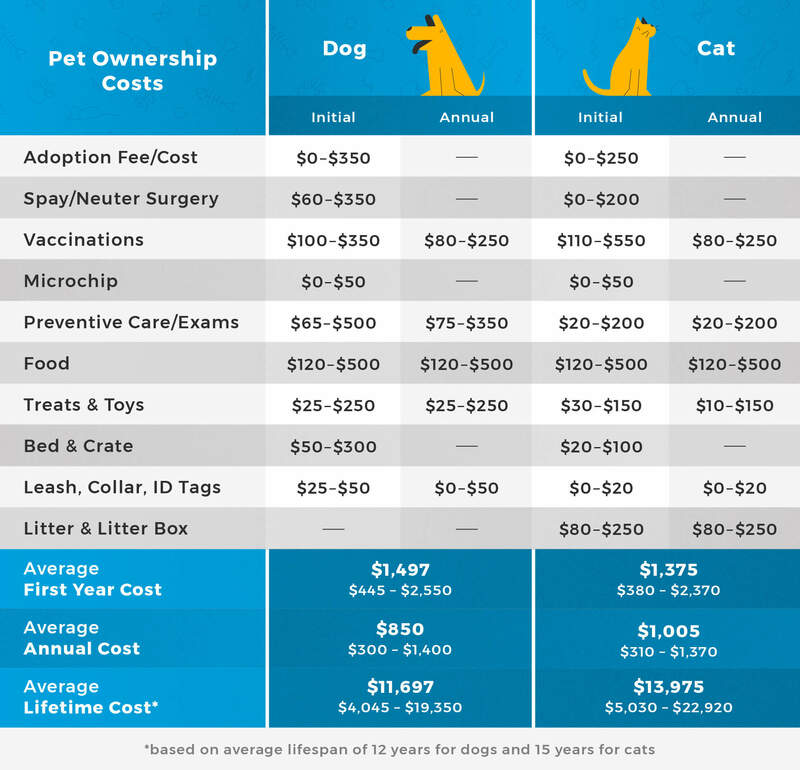 The table below illustrates the expected costs for your pet but doesn’t include any emergency care, which can cost anywhere from a few hundred dollars to several thousand! Home renters need to communicate to their landlords that a four-legged friend will be added to their lease. Some complexes have specific restrictions against certain dog breeds, weight limits and the number of pets allowed in the unit. If you’re thinking of relocating with your pet, consider that the cost of living will affect everything from pet rent to vet care. 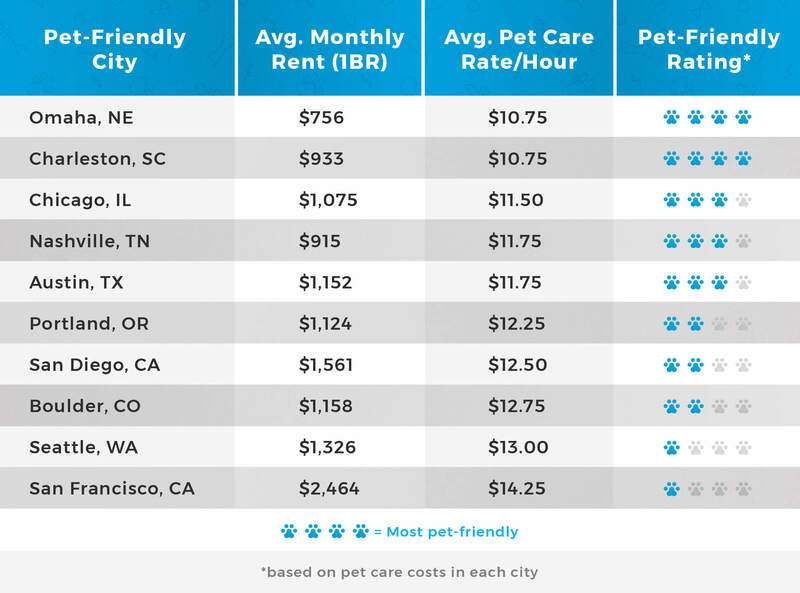 Below is a list of pet-friendly cities with the average monthly rent for a 1 bedroom apartment and hourly pet care costs. Before introducing your new dog or cat to their fur-ever home, you’ll want to pet-proof your house and pick up the essential first-day items. Prepping your home can be different for cats and dogs but generally, pick up small, chewable items that could be harmful to your pet and dedicate pet-friendly areas. If you have nice decor or furniture that can be ruined, store it elsewhere until your pet is housebroken and used to their new environment. When choosing a veterinarian, research vet offices and animal hospitals near you, including low-cost options and nonprofits that provide affordable pet care if needed. You’ll also want to locate a nearby emergency vet in case your pet needs medical care after hours. Now that your pet is at home and settling in, pick up all of the first day items and make their new space cozy. Puppies and kittens require extra stimulation so shop for a variety of toys to keep them entertained and busy while you’re away. When it comes to food, continue feeding your pet whatever their previous owner was and slowly introduce a new brand if needed. As your pet gets more comfortable, slowly introduce people and other new experiences such as car rides and bathtime. Remember that every day is a new chance to train your pet. There will be times when their behavior is less than perfect, but practice patience and reward good behavior to reinforce your training. Pets are part of the family so when it comes to emergencies, plan for their safety too. Whether it’s a natural disaster or an escape-prone pet, there are many things you can do to prepare for the unexpected. Set aside money for a pet savings fund in case there’s a medical emergency. When it comes to your pet’s safety, the last thing you want to worry about is money. Pet ownership comes with a hefty price tag but there are ways to reduce the cost of caring for your furry friend. Research pet insurance options to see if it will save you money on medical expenses. The best way to prevent a large vet bill is to keep your pet as healthy as possible with lots of exercise and nutritious food. Groom at home - Save a trip to the groomer by regularly brushing your dog or cat to help with shedding. Use nail clippers and toothbrushes to keep them in good shape. Get daily exercise - Staying active with your pet can help them maintain a healthy weight. For dogs, stay active by taking daily walks, going to the park or playing in the yard. For cats, set aside playtime with active toys and buy climbing posts to keep your cat moving. Attend regular vet check-ups - Visit the veterinarian for regular check-ups to monitor for any potential health conditions so you can treat them before they escalate. Use preventive care - Avoid expensive medical treatments by giving your pet their routine medications to prevent heartworms, fleas, ticks and parasites. Find a friend to pet-sit - Boarding costs can add up, but friends and family may offer to help at a much lower rate. Acquaint your pet with the caregiver or hold trial runs before leaving your pet while you travel. Feed your pet nutritious food - High-quality pet food helps keep your pet strong and healthy. Research different brands or ask your veterinarian for recommendations. Maintain a pet budget - Monitor your pet expenses to ensure you aren’t overspending on toys or treats! Find ways to save like price matching medications at the vet, joining a pet loyalty club or redeeming coupons on pet items. Craft DIY toys - Repurpose items to craft your own toys! Old shirts and paper towel holders can be turned into some low-cost entertainment for your dog or cat. Bake your own treats - Skip out on store-bought treats and bake some healthy snacks for your pet. You can even make frozen treats to cool your pet off in warmer weather.